Fellow modern pulpy author Alexandru Constantin issued a challenge on Friday – the Pre-Tolkien Fantasy Challenge. It’s partly a reminder to people that Tolkien didn’t invent the fantasy genre, and to shed some light on the breadth of the genre long before Tolkien got published. That’s not a slight against Tolkien. I love the Lord of the Rings. It’s just that after a point, for a decade or so, everything fantasy was a Tolkien pastiche. There are a lot more sources to steal from be inspired by. I’m going to do this in 3 separate blog posts. I’m gonna start out with a doozy and recently discovered favorite, “Black God’s Kiss,” by C. L. Moore. Now, Catherine Moore had a good bank job during the Great Depression, and writing for the pulps wasn’t exactly a well-respected trade. She didn’t want to jeopardize her job at Fletcher Trust, so to make sure her employers didn’t learn of her side career as a pulp writer, she disguised her name. And the first story she published in Weird Tales? Yeah, that was… also somewhat scandalous in its own right. Now, the cover art for that issue (by the extremely talented Margaret Brundage) is… like most pulp covers… pretty inaccurate as far as illustrating the story. One major issue is that the protagonist of the story – a fierce female warlord in medieval France named Jirel – wears a suit of Roman armor the whole time she’s in the world of the Black God. Not… whatever she doesn’t have on here. But hey, that’s how the pulps rolled. When they say don’t judge a book by its cover, I think they were referring to these kinds of covers. Okay, so the story: Jirel, ruler of Joiry, has been deposed by the villain Guillame and kept prisoner in her own castle. However, she is a master swordswoman and does not suffer in humiliation hoping for rescue. She feels a responsibility to her kingdom, and a serious desire for vengeance. Among other things, she knows of a long-sealed portal in the depths of the castle that… as far as she and the priest understands, leads to Hell… or some other place pretty dang close to it. She goes in search of a weapon to destroy her foe through a landscape that is one of the most surreal and often disturbing as anything I’ve ever read in pulp fantasy, sometimes mixed with sexual undertones. Through horrific landscapes and threats, she obtains the titular weapon – and it’s dark and twisted. Jirel is not a female Conan, although Robert E. Howard’s influence is obvious here – as is H.P. Lovecraft’s. (In 1934, Moore was a contemporary of both authors.) In fact, except for the beginning where Guillame assumes the commander of Joiry’s forces was a man from how fiercely she fought in her sexless armor, she doesn’t really get to reveal her badass swordsmanship much in this story. Aside from a battle against small blind squishy things, it’s all sheer drive and wits. And where Conan would be content to behead his opponent and then never give it another thought, Jirel… well, I’ll let you read it. And there are five other Jirel of Joiry stories to enjoy after this one (including a direct sequel, “Black God’s Shadow“). Where can you find this story (and others?) I picked up the book Black God’s Kiss from Paizo Publishing, which includes all six of the Jirel stories. You can also find five of the stories in this collection. 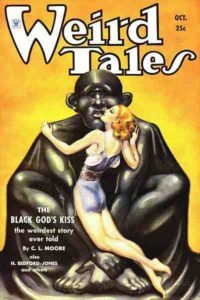 Pulp Covers has a link to the .cbr (comic book reader format) of the original Weird Tales magazine where this story can be found. Ordered a copy from Paizo! Thanks for the tip about it. Glad I could help! I hope you enjoy the stories! I sure do.